When I saw Kristians latest purchase I had to use my deep blue eyes and ask him in a very kind way if there were a chance for me to paint at least one of these wonderful ships. I got the feeling that GW's designers have been inspired of there colleges at FW since there's a ton of details that never will see daylight when the minis are glued together. But I have to paint them anyway! 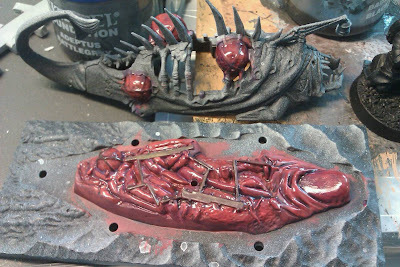 I used Gloss Varnish to make the intestines look more gooey. Thank's to Google I found some pics of monkfish/devilfishs and decided to go for a brown/bluish colour. That's the next step. I'll keep you updated! Well, you are bound for stockholm in awhile so about it then? What about Drummerboy and Nicklas Dark Eldar VS my Death Korps and Kristians Fists?